Answer: You are correct that we have accepted the reality of the space-time continuum for quite some space-time now. Probably since the first confirmation of Einstein’s theory by Arthur Eddington in 1919. Every additional confirmation added more support to that reality. Physicists now accept the space-time continuum as “real” — at least the “space-time” part. There’s still some disagreement about the “continuum” part. In math or science, a continuum is a range of values with no gaps at any level of “magnification.” The classic example is the set of all real numbers. Pick any two real numbers, A and B, and you can always find another one in between them: (A+B)/2. Most physicists believe space and time are like that too. Pick any two points in space or time, and you’ll always be able to find another point between them. But some physicists argue that, in order for Einstein’s theory to be compatible with quantum mechanics (which it currently is not), space and time would also have to be quantized. Theories suggest this would happen at an inconceivably tiny scale — something on the order of 10-35 meters and 10-44 second. This is where the terms graviton and chronon come in. The graviton, currently a hypothetical particle, would be required to carry the force of gravity through a quantized space. And the chronon (also hypothetical) is the smallest amount of time — an “atom” of time, if you will, but it’s not really a “particle” that could be directly detected. And that’s about the best (non-mathematical) explanation of the space-time continuum I can provide. To answer your other question, what LIGO accomplished was verification of the final prediction of Einstein’s theory of gravity (known formally as General Relativity). Most scientists expected LIGO would eventually find gravitational waves, and we already had indirect evidence for their existence in the energy loss observed in binary pulsar systems. But LIGO detected the waves directly. The signals are shown in the top graphic. More about what those signals mean next week. Here’s what happened. 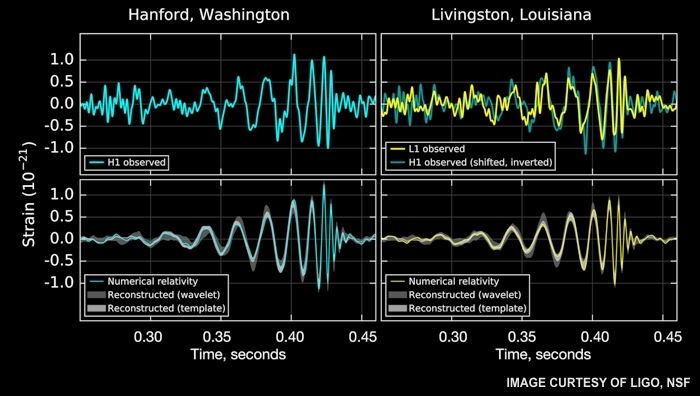 Back in September 2015, LIGO’s two detectors (in Louisiana and Washington) registered nearly identical pulses separated by a time of 7 ms (milliseconds). The detectors are separated by a distance of 3002 km, so depending on the direction the wave is coming from, the time delay could be as high as 10 ms. The fact that a 7 ms delay was observed tells us two things. First, it confirms something that was expected — gravitational waves move at the speed of light. Second, it tells us the direction the waves came from — effectively “pointing” toward the source of the waves. The signal was received on September 14, but it took them till February 11 to make the announcement. LIGO researchers wanted to make sure the signal wasn’t an artifact of their electronics or software. And it was such a big deal they didn’t want to make any hasty moves. My bet is this discovery will take the Nobel in Physics for 2016. There’s another important aspect to LIGO’s discovery. I’m sure you’ve heard about how LIGO “opens a new window into the Universe.” Up till now, the only “window” we had for observing the cosmos was electromagnetic waves (visible light, infrared, UV, x-rays, etc.). And we’ve learned a lot through that window. But unlike electromagnetic waves, gravitational waves cannot be blocked by any substance or mechanism — they pass through everything they encounter and proceed as though space were totally empty. So these waves can bring us information about phenomena otherwise unobservable. Next week I’ll say more about just what those signals mean, and what created them. I’ll close here with a great cartoon by Randall Munroe, author of the blog XKCD. He had an interesting take on what information this “new window into the Universe” might bring us. Thanks Randall, for your permission to use this. Click on the thumbnail below.